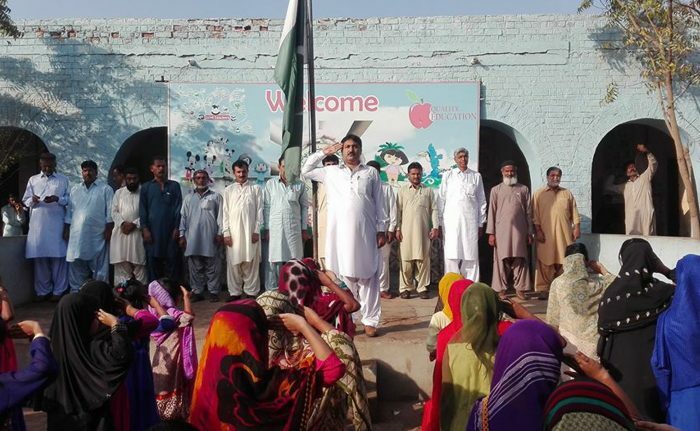 Nisar Ahmed Memon, a 43 years old headmaster at the Government Boys Main Sindhi Chandia School, in Sujawal, Sindh, has always been passionate about bringing change through education. With this resolve, he joined the field of teaching in 1992 and has since then been engaging children to learn through play and active learning. Community World Service Asia visited our school in 2015 introducing the DRR component under the Christian Aid supported project. I was instantly interested in the idea as it was a new concept and people in a rural area like Sujawal were not aware of disaster management before. We shared our profile with the team and a Disaster Risk Reduction Training was organized. Two DRR trainings were held for two consecutive years starting in 2016. Fifty students participated in each training. Participants were taught to analyze and build on knowledge to identify and prepare for major disasters and on how to cope afterwards. These skills were particularly important given the large-scale flooding that Sujawal experienced in 2010 damaging many of our houses, crops and savings. The training focused on six disasters; earthquake, fire, flood, heavy rainfall and cyclone. Sessions on measures to take pre, during and post the various disasters on minimizing its destruction and the after effects were conducted. Being the first training of its kind, teachers and students at Nisar Memon’s school showed keen interest and enthusiasm in learning through group and drill activities. As an outcome of the training, DRR groups were formed at the Main Sindhi Chandia School. With six groups in total, two students from each class were selected to represent as members in the groups. The groups have been divided as Flood Group, Cyclone Group, Fire Group, Earthquake Group, First Aid Group and Planning & Coordination Group and each group has a representation of fifteen to twenty students. A faculty member is assigned to each group to supervise them. These groups then train other students on specific DRR practices so that the knowledge is shared with everyone in school. Every week, these DRR groups brief students of a selected classroom on possible natural hazards and the measures that need to be taken. A drill activity is conducted as a demonstration for the students to clearly understand the measures, use of equipment and their role if any such emergency situation arises. All students get the opportunity to equally participate in the drill activities, enabling each student to apply their knowledge on DRR to real situations. We encourage students to share their learning at homes as well which enhances their understanding and strengthens their involvement in the community. In addition, the whole school, including teachers and students, are aware of the six main disasters and the measures to be taken. This is a great achievement for us as an institution because in rural areas this kind of skill development is not generally found. In school curriculums, the topic of natural disasters is touched upon under the subject of Social Studies but that does not provide students with DRR related knowledge or skills. Nisar Memon has introduced drill activities as part of the teaching curriculum supporting the Social Studies lessons on disasters. A DRR Carnival was organized to provide an opportunity to young children to present their DRR work. The main purpose of the event, celebrated on 25th May, 2017, was to engage teachers and students from different schools to hear about their experiences; how they implemented DRR in their schools and how it contributed to making their schools safer. Our students participated in the event with great enthusiasm. They prepared plays and skits to perform at the carnival which displayed various disasters and the role of men, women and children in tackling these disasters to reduce loss. A total of five hundred guests, including students and teachers from various schools, government officials and other stakeholders, actively participated at the event. DRR themed paintings made by students of GBPS Main Sindhi Chandia, Sujawal were also on display. The active headmaster, Nisar Memon, also participated in a four-day training on Emergency Preparedness and Contingency Planning which was conducted to train government and other relevant institutions staff on effective DRR methods. Falak Nawaz from Network Of Disaster Management Practitioners (NDMP), lead facilitator at the training, conducted an effective and productive training which enhanced our knowledge on international strategies for Disaster risk reduction and contingency planning. We were briefed on the difference between contingency planning and disaster risk management planning. In addition, we were oriented on the importance of contingency planning. Students in rural areas readily welcome whatever new learning opportunities they are offered as it allows them to further enhance their knowledge, intellect and skills. We have displayed a school map in the school which shows different exits and placements of various equipment that are to be used in times of various disasters. We have hanged bottles filled with little sand outside some classrooms. In case of no warning, the movement of the bottles will indicate earthquake or strong winds of cyclone. This way the teachers and the students will be able to take immediate measures required for the safety of all. In addition, fire extinguishers are placed in the school premises and their locations displayed on the school map. We want to ensure maximum safety of our students therefore we implement brief revisions of the map and drill activities on a weekly basis as well. We have also installed emergency bells which will ring at the time of the disaster to alert everyone in the premises. Students are trained to react accordingly to different disasters and escape routes are identified. The disaster groups are actively involved with students on how to respond to emergencies on a weekly basis. This has enriched the knowledge and developed DRR skills of around 850 students in the GBPS School. With more of these trainings and DRR activities conducted in school, the interaction between teachers and students has increased, strengthening their relation and building student-teacher trust. Many students at the school were afraid of their teachers at first and were hesitant to express themselves. After participating in the training and drill sessions, students have become more expressive and vocal with the teachers, making the learning environment in school more friendly and productive. I am happy to announce that our enrollment has increased from 723 to 850 students in just a year. Our students and teachers have shared their learning and experiences at homes and communities. This has raised our standard of learning which has attracted many parents to enroll their children in our school. The families completely trust us with their children. Recalling the floods in 2010, Nisar shared that most of Sujawal drowned in the floods. By the time the flood warning was announced, many women and children had already drowned in the rising waters as preparedness measures were not in place and there was no awareness on DRR. As the schools reopened after the flood water receded, families feared to send their children to schools. The interest in education decreased due to the overwhelming fear of the floods. Similarly, they feared of other disasters like earthquakes and cyclones hitting their homes and villages. This DRR initiative has increased the confidence of students as well as their families. They are fully aware on how to react when a warning is announced and at times of emergency situations.